When you stay at Hotel Ariston & Palazzo Santa Caterina in Taormina, you'll be in the historical district, within a 15-minute walk of Corso Umberto and Taormina Cable Car. 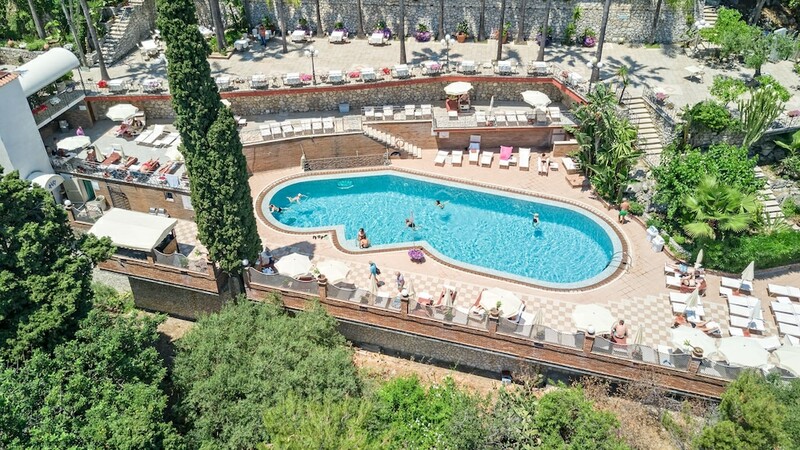 This 4-star hotel is 0.6 mi (0.9 km) from Greek Theatre and 2.2 mi (3.5 km) from Isola Bella. Make yourself at home in one of the 146 air-conditioned rooms featuring minibars. Complimentary wireless Internet access keeps you connected, and satellite programming is available for your entertainment. Private bathrooms with bathtubs or showers feature complimentary toiletries and hair dryers. Conveniences include safes and desks, and housekeeping is provided daily. Be sure to enjoy recreational amenities including an outdoor pool and a spa tub. This hotel also features complimentary wireless Internet access, wedding services, and tour/ticket assistance. Enjoy a meal at the restaurant, or stay in and take advantage of the hotel's room service (during limited hours). Unwind at the end of the day with a drink at the bar/lounge or the poolside bar. A complimentary buffet breakfast is served daily from 7 AM to 11 AM.